Do Pherone Pheromones Really Work? 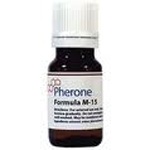 Pherone formula M-11 comes with a very fancy and scientific sounding title and it is one of the latest batches of pheromone colognes that have just made it onto the market. The company benefited early on from a moderately successful marketing campaign which helped to increase interest in the product to large proportions, but does it stand up to the claims it makes. The claim made by Pherone is a large one, and one which most other pheromone producers tend to stay away from for good reason. Pherone claims that not only will rubbing it on your skin guarantee you more attention from women, but it also promises that continued usage over time will boost your body’s own ability to produce pheromones. This must sound too good to be true for those pheromone users out there that have a poor ability to produce their own chemicals naturally. But when something sounds like it is too good to be true, that is usually because it is. The hard facts of the matter are that despite the scientific sounding name “formula M-11,” there is no research to support the claim that Pherone can help your body to naturally produce more pheromones. Taking a look at the ingredients included in the bottle, it seems as if it contains the same stuff that a standard spray or oil product of the same caliber would. While 40 dollars may not sound like much for a product that may or may not work for you, it only costs a paltry 25 dollars for a bottle of PherX and only 10 dollars more for a bottle of PherSpray, both of which have been getting rave reviews since their reception into the market in 2002 and early 2011 respectively. There is a lot more scientific evidence supporting the functionality of competitor products such as these in comparison to Pherone which still has yet to prove itself. Those that love Pherone really love it, but people with this level of devotion to this relatively new product are few and far between and it seems that most reviews of this product are generally negative. None are too harsh, but you would be hard pressed to find a truly great review for Pherone. Pherone also comes in a very small bottle which is a major con, especially if they expect you to drop 40 dollars on this product, which may be another reason why reviews have been generally negative. On a lighter note, even though it does not live up to the heftier claim about ensuring more pheromone production in the user’s body, it does contain the proprietary ingredients found in competitor products and in actual human pheromones respectively. This particular mixture chooses to focus on three of the four main chemicals found in pheromones which could be considered risky, but could also be considered an advantage. When there are fewer chemicals in a solution, this means that the concentration of each of the chemicals that are present will be greater, leading to more effectiveness. However, this also means that Pherone will be a little less balanced than competitor products like PherX. It is a give and take, but just don’t be too disappointed if you purchase a bottle of Pherone and it does not perform as promised. You have been warned.